Home RV Park Reviews	Review: Natural Bridge, Blue Ridge Parkway and Lynchburg KOA. 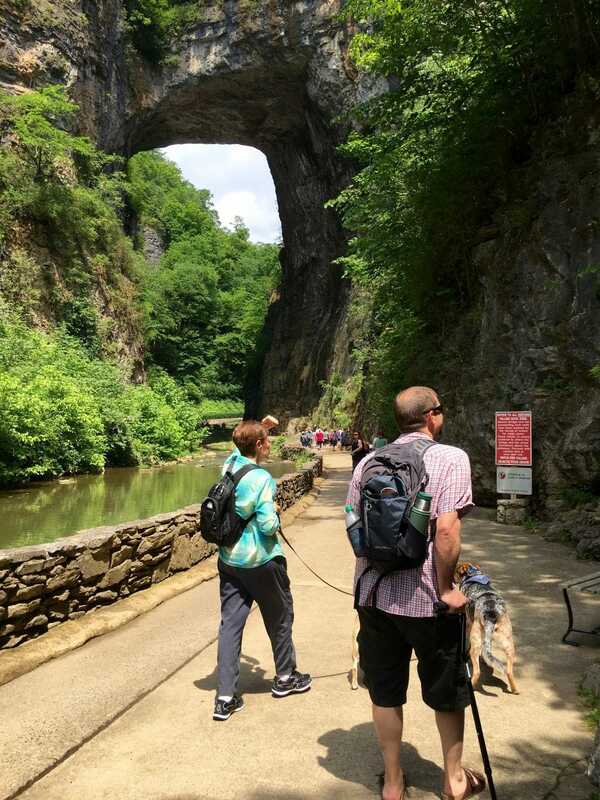 Our first trip of the season was to the western part of Virginia to visit the Natural Bridge. My mum was visiting from Australia, and my sister and her two sons joined us (they stayed in a cabin). We needed a cabin with a bathroom for mum, so we chose the Lynchburg NW / Blue Ridge KOA . 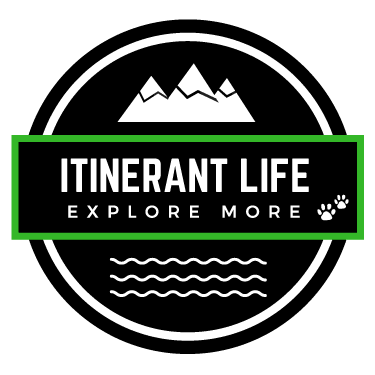 It is on the eastern side of the Blue Ridge Mountains, and just a 20 minute drive through the mountains to the Natural Bridge. HUGE NOTE: If you’re driving to the KOA, we would suggest you be careful which route you take as there are a lot of windy roads over the mountains. The drive is beautiful through the mountains though, so make sure you get out and enjoy the drives! We checked in around 3pm, and were shown to our pull through site, which was probably excessive for a 28ft. Class A, but nice for us 🙂 We were there on a Thursday through Saturday, so the camp ground was relatively quiet. The cabin my mum and sister stayed in was only a short walk across the gravel driveway. Our site was shaded with a few trees and had a fire pit and picnic table. Trash collection from your site is pretty continuous throughout the day. The camp hosts were *amazing* – super friendly people, and rightfully proud of their campground. We drove to Natural Bridge on Friday morning (in our car) and spent about 4 hours walking the Cedar Creek Trail and eating at the Summer House near the Natural Bridge itself. We started at the Welcome Center, which is right next to the gorgeous historic Natural Bridge Hotel. You can read more about the history of the hotel here. (As we didn’t stay there, I can’t say much about the interior!) The Welcome Center has a cafe, shop and bathrooms. You buy your tickets here as well. The cost of the Natural Bridge walk including the Cedar Creek Trail is $20 per adult. We received a discount for staying at the KOA – score! So our tickets were about $18 each. As we had Sidney with us (our Cattle Dog who has recently had ACL surgery) and John who suffers from a neurological disorder (we’ll explain more on this in another blog post), we took the shuttle bus down to the Summer House, which is the entrance to the Cedar Creek Trail and the Natural Bridge. It is a short drive, but beats walking down the 135 stairs! The Summer House is home to the Gatehouse Pavilion & Grille and bathrooms and is the starting point to the walk. Just a couple of hundred feet from the Summer House is the main attraction – the Natural Bridge. It was formed when a cavern collapsed and left the span that stands today. The area was also home to the Monacan Indians and there is a living history exhibit along the Cedar Creek Trail about a half mile past the Natural Bridge. The trail is very well maintained and relatively easy to walk. John had walking sticks to support him, and Sidney took the walk pretty well. At the end of the Cedar Creek Trail you will find the Lace Falls – a 30+ foot cascade that is worth the walk. Read more on the history of the Bridge here. And the Monacan Indian living history exhibit here. We worked up an appetite, and decided to enjoy lunch at the Gatehouse Grille. The food was ok – burgers, chicken sandwiches and fries. Definitely edible and enjoyable after the walk. And the view was pretty – with the creek meandering beside us as we sat under the pavilion. The 2 mile walk was a stretch for John and Sidney, but they both made it! John then even slowly climbed the 135 steps back to the Welcome Center (It was less hard on his head than the windy shuttle)… the rest of us caught the shuttle 😉 We grabbed some ice-cream in the Welcome Center and then headed out. We parted ways so John and I and the dogs could take a drive up the Blue Ridge Parkway! We couldn’t drive all the way out to the Natural Bridge and not take a drive on the famous Blue Ridge Parkway. The drive is simply gorgeous! It is a slow climb up the mountains along a 45 mph parkway through the natural forest. We stopped at House Mountain (elevation 3612′) as stormy weather was closing in. The views are spectacular of the valley below, and we would encourage you to take the drive. It is a little windy in places, and might be worse further along the parkway, but the parts we drove seemed doable in an RV.